Breaking Bets: Are Southampton relegation candidates after south coast exodus? Betting News > Football > Premier League > Breaking Bets: Are Southampton relegation candidates after exodus? Breaking Bets: Are Southampton relegation candidates after exodus? The worst kept secret in football is finally out after Dejan Lovren signed on the dotted line and became the third Southampton star to leave St Mary’s for Anfield this summer. The Croatian international joins Adam Lallana and Rickie Lambert at Liverpool and with the likes of manager Mauricio Pochettino and England full-back Luke Shaw also leaving the south coast, for White hart Lane and Old Trafford respectively, it promises to be a tough season ahead for the Saints. The bad news does not stop there for new Southampton boss Ronald Koeman as the Saints look set to continue marching out the door with England youth star Calum Chambers close to securing a move to Arsenal and Liverhampton, erm sorry, Liverpool being linked to a move for Jay Rodriguez. Morgan Schneiderlin is yet another name linked to join the Southampton exodus with north London rivals Arsenal and Tottenham both battling for the French international’s signature. And with Koeman, who has no previous Premier League experience to call on, tasked with rebuilding the squad from scratch Ladbrokes have created a special price of 33/1 for Southampton to finish bottom of the league come next May. Southampton rose from League One to eighth in the Premier League in just four seasons and were described as the best side to visit Old Trafford in their first season back in the top flight. 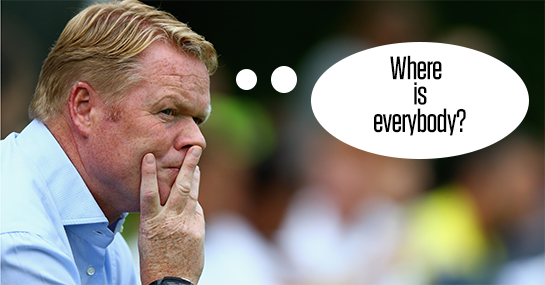 But not much remains from that era as the club looks to usher in a new era under Koeman. The Dutchman has so far signed Graziano Pelle and Dusan Tadic from the Eredivisie but the former Feyenoord boss will need to make many more additions if his side are to even come close to matching last season’s eighth placed finish. But time is running out before the start of the season and with just 35 days remaining before the transfer window slams shut the Saints board will have to act fast to be ready for the new season. Koeman’s side visit Liverpool on the opening day and are 7/1 outsiders to take three points, while Liverpool are the 2/5 favourites for a likely victory. Clashes with West Brom and West Ham follow and if Southampton cannot bring in adequate reinforcements and do not pull together under Koeman, it could prove to be a very long season for the St Mary’s faithful.